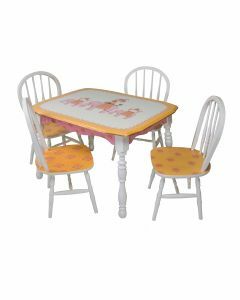 Part of the exquisite Enchanted Forest collection, this play table and chairs set makes a lovely addition to any playroom or nursery. 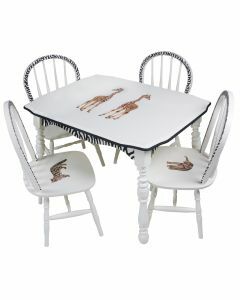 Price as shown includes one round table and two child chairs in the enchanted forest motif in an Antico white finish. This item is available in variety of styles and finishes. If you are interested in ordering, please contact customer service for custom options. 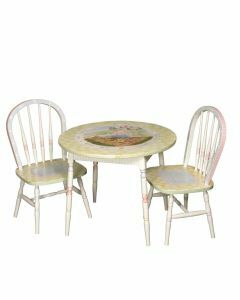 Please note Artwork is featured on our discontinued Round Child Table and Chairs; when ordering this item we will have our artist hand paint the same motif on our new Table and New Child's Chair. Click on images for greater detail. Please note this item is custom made to order and has a lead time of 10-12 weeks.